﻿ iPhone 3GS Overheating due to running at 100% when in standby. Orange County Computer INC. > About Us > Blog > Mobile Phones > How to resolve Apple's iPhone 3GS Overheating & Battery life issues. Just a week after the release of Apple’s new iPhone 3GS, a few owners have complained about the handset’s high temperatures, which in some cases are high enough to start browning the white plastic on the back of the phone. 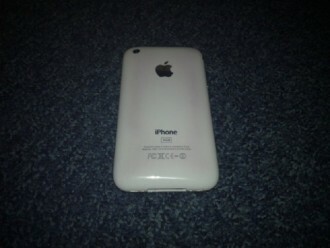 Notice the battery rectangle burn on the back cover plate. I had noticed from day one that the iPhone 3GS appeared to have similar heat issues to iPhone 3G: The phone's back got warm during use. I thought it curious that handset still got warm in many of the same areas as with the 3G. I also noticed that the battery life was drastically reduced. Why: Do to the mass production of the iPhone 3GS, several batches had corrupt images (3.0 Firmware). So when users received the iPhone 3GS the 3.0 Firmware is corrupt. It seams to function normally except for the Overheating and battery issues. Whats happening is the iPhone 3GS processor is running at 100% when in standby. Thus causing the 3gs overheating issue and the battery life is shorted drastically. 1. Do not restore from a previous backup, (this backup most likely has the corruption as well). 2.Download the 3.0 firmware or do your own factory default installation and Restore 3.0 Firmware from iTunes. This resolved several overheating and battery life issues for several users. ← Is a SonicWALL Right For Me?